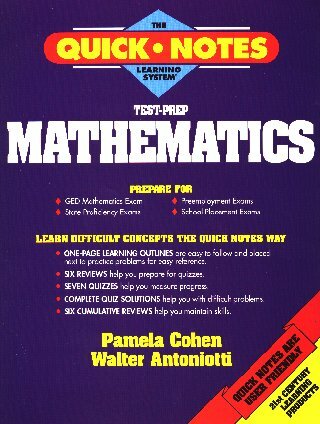 covers more advanced areas of mathematics. is a 252 page book for people who want to quickly study basic high school mathematics. Only the most important concepts are explained by the 49 one-page learning outlines of Test-Prep Mathematics. Minimizing descriptive material makes learning difficult but familiar concepts easier. Adjoining page of practice problems. Additional practice problems for more practice. Complete solutions are provided for the tests and quizzes. Answers are provided for practice problems. AAA Math is verbally oriented. Understanding Algebra is short book beginning with arithmetic. Pre Algebra Videos covers many topics. Progression-Videos K-5 is for teachers and learners. Math Lessons That Are Fun has unique problems. Test-passing for Mathematics will help you do better on tests. with your suggestions for this space.